Christmas is coming. For people at ECLA, it is not too early to have a Christmas party, as the end of term rapidly approaches. 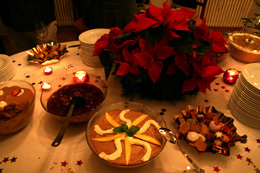 And of course, no one should miss an opportunity to have a Weihnachtsfeier. On Tuesday night, the whole ECLA community, students, faculty, administration and family members met at the Yellow House, the residence of president Larry Boetsch and his wife Elizabeth. Guests were warmly welcomed by the light of candles and lanterns leading up to the entrance door. The atmosphere was very cosy: candles, lights, and, most importantly, a Christmas tree. What would a Christmas Party be without Christmas carols? This was the responsibility of the ECLA choir under the instruction of Michael Geisler. Multilingual carols were performed by six devoted singers and “angel-like voices rose to the air” in Latin, French, English and German: Nowell, nowell, Glooo-hohohohoho- ooooooooria, Sti-hi-lle Nacht… , crowned by Daria Coscodan’s solo piece “Holy Night”. The eating, chatting, singing and joking continued into the evening. Some people used the opportunity to speak to someone they had not had the chance to approach before. As the amount of cookies finally diminished and tiredness crept into eyes and faces, the guests took their leave, one after another, to return home not without a great thanks to Larry and Elizabeth for this friendly evening.